General Haig launches an offensive to capture the important transport hub of Ypres in Belgium. The battle is famous for the terrible heavy rain that turned the battlefield into a nightmarish mud bath. 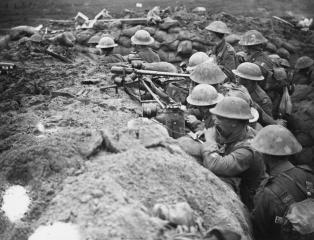 The 38th (Welsh) Division were heavily involved in the opening attack of the battle at Pilckem Ridge and were successful in their mission. Private Ellis Humphrey Evans of the 15th Battalion, Royal Welsh Fusiliers, was killed in action at the Battle of Pilckem Ridge on this day. Private Evans is perhaps better known by his bardic name, Hedd Wyn. Three Welshmen were awarded the Victoria Cross for their actions on this day: Corporal James Davies of Ogmore Vale, 13th Battalion, Royal Welsh Fusiliers; Sergeant Ivor Rees of Felinfoel, Llanelli, South Wales Borderers; and Sergeant Robert Bye of Pontypridd, 1st Battalion, Welsh Guards. Find out more about the battle and the Welshmen who served.